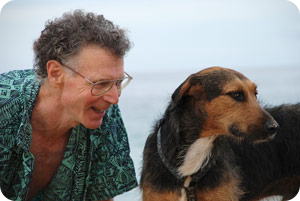 Phone consulting with Richard Conrad Ph.D. : 808-695-1128, 10 to 4 Hawaii time. I don't charge for the first five minutes. I can call you right back to save you phone charges. Or email me using the Contact tab to set up a phone appointment. I was raised in New Jersey, and won a couple of national science awards while in high school. I graduated from Brandeis University in 1962. I obtained a Ph.D. in Biochemistry from Johns Hopkins University in 1968, in the same building that many of the vitamins were first discovered and researched. My thesis work involved designing, building and using electro-optical equipment to measure fluorescence from proteins, including measuring resonance transfer of light energy between amino acids and dyes to determine conformational changes in enzymes. I did post-doctoral work on the mechanism of vision in the Department of Molecular Biophysics at Florida State University in Tallahassee. Then I spent some time in the Biochemistry Department at Cornell University where I designed an ultraviolet laser-based scanner for measuring proteins while they were spinning in an analytical centrifuge. As an Assistant Professor at the University of Washington in Seattle, I taught biochemical laboratory technique and cell physiology, and created a seminar: Conscience versus Curiosity in Science (I was an environmentalist even back then). My passions were studying the interaction of life and light, biological oceanography, sailing and swimming, rock climbing, nature photography, and playing the oboe in amateur chamber orchestras. I was also very interested in pharmacology, neurophysiology, animal behavior, anthropology, and human psychology as animal behavior. I spent a number of years experimenting with different ways of disinfecting my swimming pool and hot tub. During this time I developed and patented ozone generation equipment for purifying water, which included the design of a high frequency switching power supply and control electronics. While I lived in Tallahassee they sprayed the streets at night with DDT, and I had to stop playing Judo because my joints became weaker and fluorescent lights began to give me headaches. A few years later I caught hepatitis A in an epidemic, and although the infection was gone and liver enzymes were normal six weeks later, I remained extremely fatigued for ten years, and became even more sensitive to flicker and fluorescent lights. I moved to northern California, and just as I was getting some strength back, I developed MCS (I discovered mold under my bedroom rug from a leak in the shower wall in the next room), and was found to have autoantibodies (thyroid, ANA, smooth muscle). Possibly the autoantibodies had been triggered by the viral hepatitis, and the fatigue may have been due to the autoantibodies and associated cytokines. (Most people with MCS have autoantibodies.) I did not become electrically sensitive until a few years later when I started using a projector as my computer monitor in an attempt to have a monitor with less flicker. Flicker affected me so much that I did a lot of research on it, using a photocell and oscilloscope to measure all types of fluorescent and other light sources, and all types of computer monitors, and so I have become an expert on flicker. Since then I have found supplements which reduce my flicker sensitivity somewhat. I did a two-week sauna detox with progressive niacin, which cut my chemical sensitivity reactions in half. I have moved five times since developing MCS, have remodeled extensively each time, and have helped many others with safe remodeling. I have built my own extremely low EMF keyboard, mouse and flickerless projector-monitor, and am working on keyboard/mouse ergonomic patents. I now live on Oahu, and swim in the ocean almost every day with at least 2 of my 5 dogs.